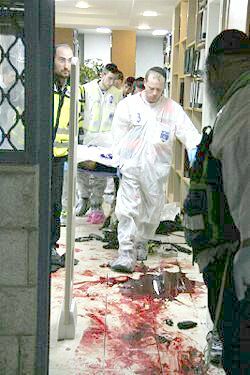 Thursday evening, March 6, 2008, Ala Abu Dhaim, 25, a Palestinian gunman terrorist from East Jerusalem, entered the Mercaz Harav yeshiva, found the library crowded with students studying Torah, and pulled out his Kalatchnikov AK-47 from a box he was carrying. He fired his automatic weapon killing eight students and wounding nine others. Students scrambled under desks and jumped out the second floor window to get out of the range of the weapon fire. Yehuda Meshi Zahav, the head of the Zaka emergency service described the scene after the shooting as "like a slaughterhouse; the floor was covered in blood"
Emergency medical workers carry out the wounded and dead. These priceless students were the best of the best, pure gold. Each one of them had unique and different good values in Torah studies, at work, in charity and kindness. The eight slaughtered students from the Mercaz Harav Yeshivah. The library where the slaughter occurred. The families of the slain students, their friends and friends of the yeshiva came to the yeshiva for the mass funeral. When there are accusations against the people of Israel, God takes the righteous in order to atone for the sins. They are roses who were picked and thanks to them God will have mercy on us. Following the concluding eulogy by Jerusalem Mayor Uri Lupoliansky, the eight families of mourners tore their shirts and recited aloud the Kaddish prayer. 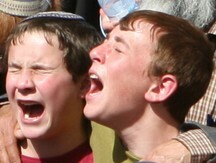 Palestinians cheered over the slaughter of the young students. 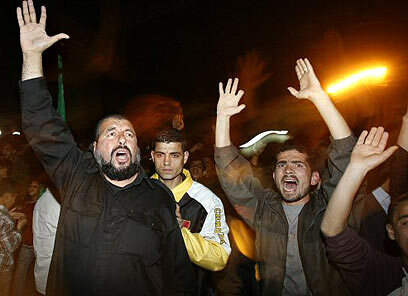 Thousands took to the streets of cities in Gaza to celebrate. 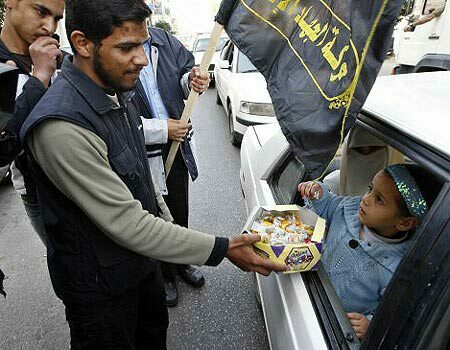 Hamas activists gave out candies and cakes to anyone who passed by. 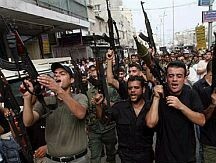 In Gaza City, Hamas militants fired their guns joyously in the air. Have you been so scarred by the Arab-Israeli conflict that you have ceased to see the image of God in those innocent victims? Have you become so hardened by this conflict that you could somehow justify the taking of innocent lives at prayer?" 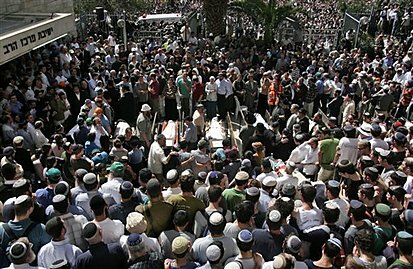 The attack at the yeshiva was a barbaric murder of eight children who were engaged in religious study. ... This odious and inhuman terror attack exemplifies the extremist and inhuman path of the terror organizations Hamas and Hizbullah.